Stephen McPartland, Member of Parliament for Stevenage, is supporting the Hertfordshire Society for the Blind’s (HSB) campaign to encourage local residents to make sure they have their eyes tested regularly. Eye tests allow early signs of preventable eye diseases, such as glaucoma or problems relating to diabetes, to be picked up by opticians. Stephen McPartland, Member of Parliament for Stevenage and member of Science and Technology Select Committee, welcomed the Rt. Hon. David Willetts MP, the Minister for Universities and Science, to perform a topping-out ceremony as a key milestone in the construction of the new Bioscience Catalyst campus. Stephen said, "I was proud to welcome the Minister for Science to Stevenage and delighted with the massive government investment that will make our town home to 1,500 world class scientists. The medical research and innovation which will save lives in the future and transform how some conditions are treated will be developed here in Stevenage. This is a great boost for our town and ensures we will remain at the centre of a leading edge high technology economy." The Stevenage Bioscience Catalyst is the UK’s first open innovation bioscience campus and has already resulted in £38 million of investment, including £20 million from government. It is now entering the final phase of building prior to targeted opening early next year. 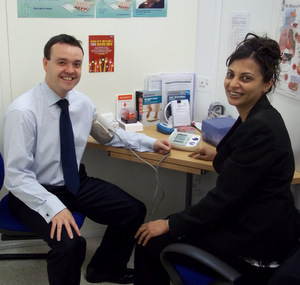 Stephen McPartland MP's visited a pharmacy in Stevenage Town Centre recently to hear about the range of services being provided. Staff at the Boots branch explained that pharmacy services are much more than filling prescriptions and highlighted the preventative health services, consultations and treatments offered. Stephen McPartland MP has joined Prime Minister David Cameron in giving his backing to a new competition aimed at giving budding entrepreneurs based in Stevenage a unique opportunity to showcase their ideas and designs in front of thousands of visitors as part of this year’s Conservative Party conference Start-Up Hub offering the budding business leaders the chance to show off their work. Stephen is pictured taking part in a recent seminar for students at North Hertfordshire College to explain more about setting up a small business and the encouragement the Government is giving to help make the process easier for young people who want to be their own boss. 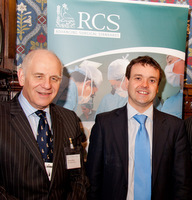 Stephen McPartland, MP for Stevenage, hosted the launch of the Royal College of Surgeons report, “From Theory to Theatre: Overcoming barriers to innovation in surgery” in which a number of recommendations are made of how research and innovation in surgery may be increased. Stephen works closely with the Royal College of Surgeons to ensure surgical innovation to develop new treatments is given a high profile nationally. 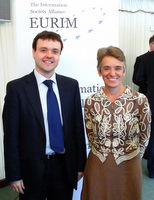 Local MP Stephen McPartland hosted the Information Society Alliance (EURIM) 'Britain: Open for Business' reception at the House of Commons to launch its first policy study on Shared Infrastructure to help keep Britain competitive in the global Information Society. 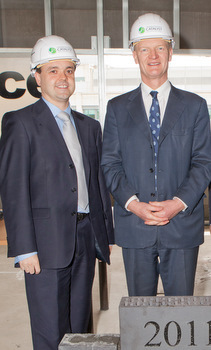 Stephen said, “I was very pleased to host this event on how we ensure that ‘Britain is Open for Business’. It is essential that Government does all it can to ensure Britain is an attractive location for companies to invest in. We were joined by Ed Vaizey MP, Minister for Communications, Culture and the Creative Industries, who welcomed the event. Stevenage, is the base for many high-tech companies, and we are helping to lead the UK out of recession. It is essential we keep Stevenage at the forefront of the high-technology sector and ensure multinational companies continue to invest in jobs and facilities locally. I will keep raising the profile of Stevenage as a centre of high technology excellence." 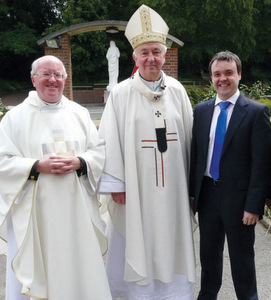 Stephen McPartland MP had the opportunity to meet the head of the Catholic church in England and Wales, Archbishop Vincent Nichols, recently at St Thomas More Church in Knebworth. Also pictured is Canon Daniel Cronin, who is the Catholic priest at Knebworth. 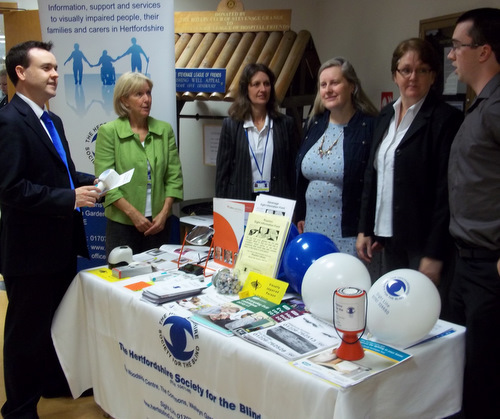 Stephen McPartland MP for Stevenage joined local campaigners from Breathe Easy North Herts and the British Lung Foundation at the Lister Hospital to highlight the new service available to provide for the treatment of obstructive sleep apnoea (OSA). 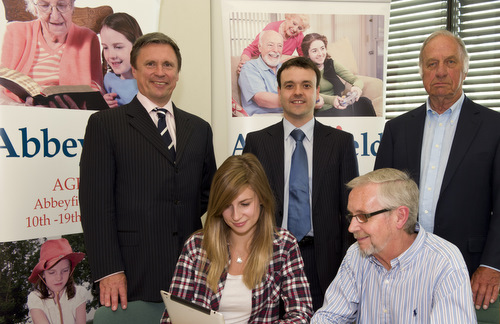 Stephen McPartland, MP for Stevenage, is lending his support to Abbeyfield Week, which this year has a theme encouraging older and younger people to swap skills.